Change the label to match whatever you're brewing up at a moment's notice with these user-friendly custom tap handles. Looking to constantly maintain a fresh look of your bar tap handles? 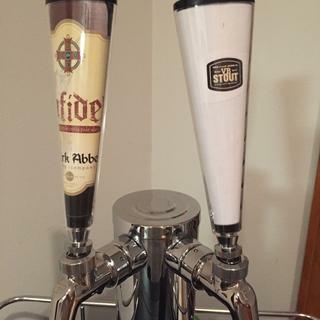 With a customizable design, you can change the looks of your taps as often as you change your kegs! The Branding On Demand Custom Beer Tap Handle features a cone design that allows you to print out your very own tap handle insert and insert the new label into the handle. Your custom label wraps 360° around the tap handle for a truly unique style and foolproof organization. The clear plastic exterior keeps your label protected and dry. When you’re ready to change out the messaging or keg, simply replace the label and reuse the tap handle. We even provide a free printable label template. With this customizable beer tap handle, you can show off your creativity and pride in your homebrew beer. Or, you can create a unique, branded labeling system for your commercial bar. The possibilities are endless. And since you can use the same handle for every beer you serve on the faucet, you can save time and money. This custom tap handle is 6 inches tall and made with a durable, lightweight construction. The cap can be sealed to prevent tampering. Since it’s designed to fit any standard draft faucet, you can replace your old tap handle and/or install your new branded bar tap handle very easily: just screw onto the faucet lever collar atop your draft faucet. It can be screwed on from the bottom of the unit so that the desired logo is visible to your bargoers. This product is very cool! It was easy to print, cut & fit our company logo into these handles. We have used them twice for company functions and got positive comments on them multiple times!!! Nice solution to a common challenge for small self-distributors. The tap handle template is fairly simple to apply your own design for your product. Did not come with any tap handle hardware. The plastic handle will screw onto a male screw, but it's guesswork. Grabbed several of these and am very happy I did. I have two on my keg fridge and will be using the rest as the keezer gets completed. Was easy to grab some artwork for the two kegs I have on tap and put in the handles. Beats a white board for sure. I look forward to putting my own labels in when my beers are on tap in the keezer. These handles are a great idea! Once I have the label template figured out I am sure things will be smoother. The template is just a PDF of an outline. The outline is shorter and narrower than the handle insert and, since it is a PDF, it is difficult to edit. The only quality issue is that the threads are plastic instead of metal inserts so they may not stand up to much use. I do like being able to identify beers in my seven taps so worth the effort. Setting up a few keg accounts out of our brewery. Need a custom product handle for our products. Could not find one I liked. Gives me the opportunity to display artwork for kegged beer that I would normally use for my bottles. Customizable and look to be lightweight. I'm setting up a patio bar with a double tap kegerator. I have a son who is a brewer and who wants to design beers for me. These handles will allow me to design names for the beers he designs (and identify which keg is attached to which handle). I'm designing coasters for each beer also. As I rotate each beer in, I can have a custom design for each style. Its faster than getting custom handles and I need a solution now. Customize branding for wholesale accounts and festivals. Chose it for price & because it can be customized. Seems like a good alternative to chalk or whiteboard labeling of beers in my keezer. I look forward to getting them and seeing how the do. for the ability to do day to day messages on the tap. 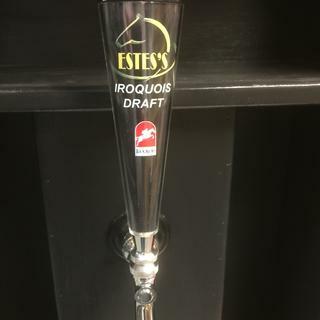 Because we're still having our custom tap handles made and these are an excellent alternative. Thanks! Because of being able to customize it! How do I copy and paste into the printable template? BEST ANSWER: I use the template as nothing more than a scissor guide to cut out the shape. I copy and paste pictures over, on top of, or inside the template. I add text, background and other images as desired. Then print, cut and fold it in the circle to test the results. I often find I have to go back and make the images and txt much smaller (than I might have thought before the template is rolled into a cone.) After making a few you begin to understand where the txt and images need to be. Hope that helps. John, I have printed several designs for the different holidays. I simply print a picture on a paper and then lay the template under it and trace it. Cut it out along the tracing and it fits perfect in the tap handle. If you try and match the ends of the paper, it may take several tries, but if you don't need an exact match, it's easy.